Ignition isn't that well-known yet, given that they've been around for a short time. Less than a couple of years. 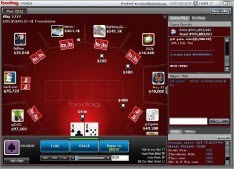 However, their parent company, Bodog, has been around since 1994. Ignition is just the rebranded version of Bodog for US players. So they're still the great, safe site that everyone likes to visit to play poker, casino games and bet on sports. Below is my review of them from a US (poker player) perspective. Please Note - If you live in New York, Maryland, Washington DC or Utah you will not be able to play at Ignition. Players that reside in any of the states mentioned are welcome at this poker site. Ignition Poker has been online since 2006. Offers poker, casino and sportsbetting to US players! Ignition offers a number of promotions to new and old players alike. If you're a new player to Ignition, I highly recommend checking out their deposit bonus. Ignition will match your first deposit 100% up to $1,000. So if you make a deposit of $500, they'll give you $500. This is a quick way to build your bankroll. The best part is that your "first" deposit is calculated on a day-to-day basis. What that means is that you can make several deposits to take advantage of the bonus, so long as you make it on the same day. Click here to join Ignition Poker and qualify for a 100% to $1,000 bonus. Example - Deposit $100 and receive a $100 bonus! However, before that money becomes yours, you'll need to clear it by playing real money games and earning points. For every 5 points that you earn $1 of your bonus is "earned." The bonus will release in increments. The first $10 increment comes after you've earned 50 points. From there, you'll be given your bonus once you hit the 200, 500, 750, 1500 and 2k point marks. Points are earned by paying rake; you'll earn 3 points for every $1 you pay in tourney fees and up to 1 point for up to every $3 taken in rake at cash games. One important thing to keep in mind is that Ignition uses the contributed method of calculating rake. This means that you need to actually play hands to earn points. Last thing -- you have 60 days to complete your bonus. $100k New Player Qualifier - As a first time depositor you will receive 6 tickets to the Sunday $100k qualifiers. All you need to do to qualify is make your first deposit and earn your first poker point. Royal Flush Bonus - Get a royal flush and win the pot plus up to 50x the big blind (up to $200). $15k Monthly Freerolls - Two $7500 freerolls run every month. You can buy yourself a seat with points (1,000) or earn a seat via satellite, which also takes points (25-200). The freerolls pay the top 20% of the field. First place gets $1,000! Ignition provides both play and real money games to players all around the world, including the US. However, they don't accept players from all 50 states. The states with stricter laws (think Washington, Kentucky, Maryland, etc) are excluded, and cannot even create an account. To get started all you need to do is visit Ignition using the links on our page and take your pick from PC or Mac software. Click download, and you'll be taken through a quick wizard that will help you download the software, setup an account and screen name. The entire process takes about 5 minutes, and once you're done you'll be able to play not only poker, but make sports bets and play casino games, too. You can fund your Ignition account using Visa, Mastercard, eWalletXpress, Western Union and Rapid Transfer (MoneyGram). If you have any problems with downloading the software, making your deposit or anything at all, Ignition can be reached via their contact form on their site. They quote 4 hour (max) turnaround times, but in my experience they're much faster than that. You can also give them a call at 1-866-909-2237 or use their FAQ page if you have a basic question. What Games Can You Play At Ignition? At Ignition you can play holdem, omaha (hi/lo) or 7-card stud (hi/lo). For cash games the stakes range from .02/.05 to 20/40 for holdem, .02/.05 to 30/60 for omaha and .05/.10 to 3/6 for stud. Holdem is by far the most popular game, but last I checked there were games running up to 2/4 (and lower) for omaha. For sit n go's the stakes range from $1 to $200. The variations available include double ups, turbos, heads-up, hypers and satellites. When I last checked Ignition out there were few games running though. The tournament section is where Ignition shines the most, at least in terms of value. There is over $900k in prize money guaranteed each week. On Sunday alone there is $250k in tournaments being played. And this is all the minimum -- the prize pools can get much higher depending on how many players join. These tournaments have buy-ins that range from $11 to $162. But you can earn yourself a seat to any of these games for as little as $1. This is definitely a great way to build your bankroll, as well as make every $1 you spend count.